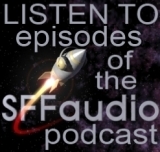 The SFFaudio Podcast #029 – Jesse and Scott are joined by Julie D. of the Forgotten Classic podcast. Listen in as Julie gushes over the new audiobook of Ken Scholes’ novel Lamentation! We also talk Space Opera, libraries, and how to read a paperbook: “Breaking the spine of a book is like breaking the spine of the family dog.” Ya, it’s a Buck Roger-ish show. Hyperion by Dan Simmons, David Weber, “The Honor Harrington” series, On Basilisk Station, military SF, Audible Frontiers, John Ringo, March Upcountry, Off Armageddon Reef, Theodore Sturgeon, More Than Human, Venus Plus X, To Marry Medusa, Nancy Kress, Beggars In Spain, Infinivox, Blackstone Audio, Beggars And Choosers, Beggars Ride, Children Of Men by P.D. James |READ OUR REVIEW|, BBC Audiobooks America, Rollback by Robert J. Sawyer, Doctor Who, Audible’s new format 4, radio drama, audio drama, 2000X: Tales of the Next Millennia |READ OUR REVIEW|, Spoken Books Publishing, Dr. Wasserman’s Time Chamber: Preventing Armageddon by Lee Geiger, Lamentation by Ken Scholes, Fantasy, Foundation by Isaac Asimov, George R.R. Martin, Dune by Frank Herbert, Macmillan Audio, Simon Vance, The Prestige by Christopher Priest, The January Dancer, SciPodBooks, LibriVox, The Green Odyssey, Space Vulture, Who Framed Roger Rabbit, Grim Space by Ann Aguirre, the “Gap” series by Stephen R. Donaldson, ScottBrickPresents.com, The Phoenix Legacy, Frankenstein by Mary Shelley, Tony Smith, StarShipSofa, Trophy Wives, Twitter, Neil Gaiman, OTRcat.com, Worldcat.org, the Amber series by Roger Zelazny, Maria Lectrix, giving up blogs for lent. Hey, where did they go? Moving to the top of my “coffee table chat” type podcasts, I am missing SFF AUDIO. One of my favorite guests is Julie…a great idea… have her read little enticing bits to send us to Forgotten Classics. Please, please, bring back SFF AUDIO PODCAST! Windows Weekly – almost like listening to SFF AUDIO PODCAST – really!